Job Trust is still looking for Housekeepers, Dishwashers, Cooks, and Waiters/Waitresses. 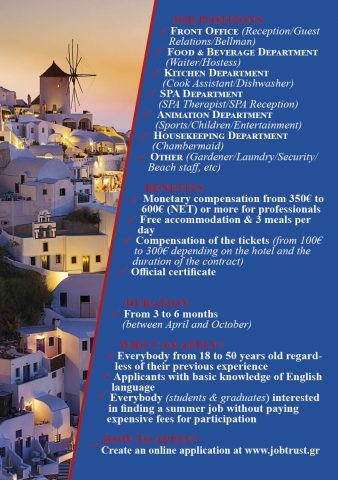 There open positions in Halkidiki, Corfu, Santorini, Mykonos, Crete and other islands. Accommodation and three meals per day are totally provided! 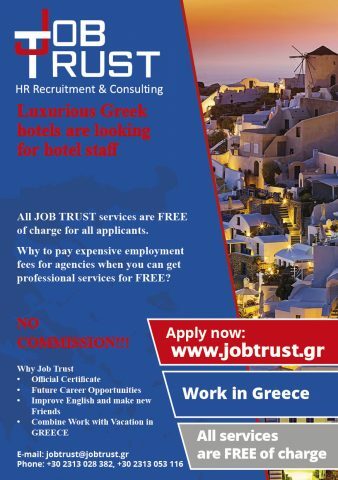 If you haven't applied yet, don't miss this opportunity and make an application form on our website www.jobtrust.gr and contact us for an interview as soon as possible. 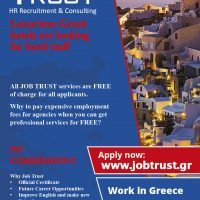 If you do have an account but you didn't have an interview, then you can contact us on weekdays from 9:00 to 17:00 (local time in Greece) on SKYPE (name: jobtrust & it appears as INTERVIEW WITH JOB TRUST) or VIBER ( viber : +30 698 824 8850) Also our phone number is +30 2310 326 946.